William “Bill” R. Scherer cofounded the firm in 1974 with his late partner Rex Conrad. Over the past almost four decades, Mr. Scherer has grown Conrad & Scherer into one of Florida’s leading law firms and has expanded the firm’s presence with offices in New York, New York, Brevard, North Carolina, and Quito, Ecuador. AV® Preeminent™ Peer Rated by Martindale-Hubbell® since 1987, Mr. Scherer is a seasoned trial attorney. He has litigated over 100 trials in both jury and non-jury cases before state, appellate, and federal courts. Mr. Scherer’s cases and legal accomplishments have received coverage by major television networks such as CNN, CNBC, MSNBC and FNN and national and local newspapers such as The New York Times, Los Angeles Times, The Wall Street Journal, South Florida Business Journal, the Daily Business Review, the Sun-Sentinel and the Miami Herald. Mr. Scherer was lead counsel for victims of the infamous multi-billion dollar Ponzi scheme orchestrated by Scott Rothstein. 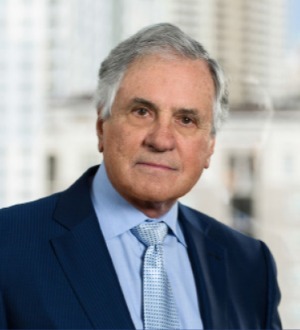 Notably, Mr. Scherer led his complex litigation team and achieved an historic settlement returning to investors what is said to be the highest percentages of recovery for victims of a Ponzi scheme. News outlets described the settlement as a “huge victory” and a “landmark” lawsuit. In 2005, Mr. Scherer served as plaintiff’s counsel in a high-profile commercial lawsuit involving the sale of a health insurance company and obtained, by jury verdict, one of the largest damage awards in Broward County history. During the historical 2000 Presidential Election Litigation in Florida, Mr. Scherer led a team of attorneys representing President George W. Bush and personally represented the President in the Broward County recount. In addition to his litigation practice, Mr. Scherer has also served as counsel to various government entities. From 1988 to 2005, Mr. Scherer served as General Counsel to the North Broward Hospital District, one of the largest public health care providers in the nation, with four hospitals and nine specialized treatment centers. As General Counsel for the Hospital District, he supervised teams of legal experts in healthcare and malpractice law, and was responsible for all trials and legal actions taken by or against the Hospital District. Mr. Scherer began his legal career as a law clerk to the Indiana Supreme Court and the Honorable Charles Fulton, Former Chief of the United States District Court for the South District of Florida.